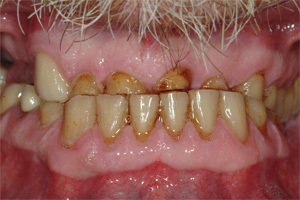 Do you have severely worn teeth that don’t look attractive? Do you want a brilliant smile that instantly warms up a room? Dr. Daniels offers solutions to enhance every imperfect smile, offering exquisite dentistry. With an eye for first-class results and specialized training, he will help you reach a new level of dental health and beauty. Full mouth reconstruction is a term used to describe the rebuilding of both the upper and lower teeth to restore natural beauty, bite and function. You may need full mouth restoration if your smile is aged, worn or damaged. The damage could come from years of clinching and grinding, acid reflux, traumatic accidents, or damaged crowns and fillings. Some people call full mouth reconstruction a smile makeover. 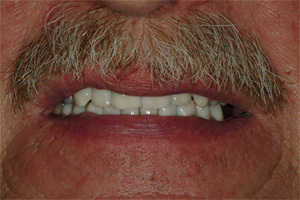 This patient came to Dr. Daniels with worn teeth and a history of acid reflux that had severely eroded his front teeth. Dr. Daniels removed the failing dental work and restored his mouth with beautiful all porcelain crowns. The result was a stunning looking, comfortable Sedona smile that functions as great as it looks. 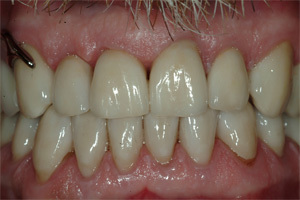 What are the Steps to treat severely worn teeth? 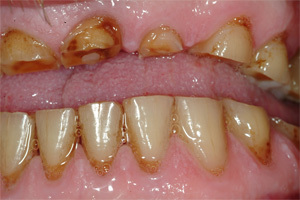 Treating severely worn teeth is a very complex process. Dr. Daniels will spend hours of time behind the scenes assessing and designing your reconstruction. It starts with photos, diagnostic models of your teeth and an accurate recording of your bite and jaw relationship. Based on this information a full mouth mockup of the proposed new teeth is fabricated in wax by Sedona dentist Roy Daniels. Once this step is complete we will schedule your appointment to begin your full mouth reconstruction. Depending on your individual situation you may have more than one visit. After the teeth are restored for underlying problems to ensure a strong foundation, Dr. Daniels will place prototype (temporary) restorations to ensure comfort, function and esthetics. You will wear the temporary restorations for approximately 4-6 weeks while your new teeth are being crafted. Once your new teeth are ready we will try them in, confirm that they fit and function well, and get your approval to bond them in place.